In many ways, it’s never been harder to work in banking or the wider financial services (FS) sector. There are many pressures that have arisen over the past decade, ranging from public mistrust of the industry as a whole, to the emergence of more agile challenger brands and startups that are able to offer quicker, smarter and more appealing products and services. There is also the issue of ever-increasing volumes and complexity of compliance requirements. Many FS organisations are active in a number of different countries, and demonstrating good governance and compliance in each of these is a highly demanding task. Furthermore, due in part to the financial crisis of 2008, there is a need to show more transparency in decision making, to both regulators and to potential customers. A related challenge to these, is the need to embrace digital transformation. With many banks and FS providers established decades or even centuries ago, there is an inherent conservatism about change and new approaches to certain processes. Yet most banks have realised the need for change and are much more open to innovation and collaboration than they have been. What are the main challenges they are facing and how can they succeed in the new digital business climate? Part of the need for digital transformation is meeting the changing requirements of customers, whether that’s consumers in a retail bank or professionals in an investment bank. They expect smart, slick and efficient products and services, and they are prepared to switch providers if their requirements are not met. So for investment banks and others areas of FS, this is a problem. While senior management are alert to the need for change, actually embarking on a digital transformation programme is another matter entirely. With legacy systems, siloed departments and some internal resistance, transforming a business to be fully digital is a major undertaking. Yet really, banks do not have much choice in this matter. There are already facing strong competition and at some time soon it is possible that Amazon or Google will launch similar services. Whether that’s targeted at consumers, at businesses or both, then it is easy to see how such a service will gain in popularity and users very quickly indeed, further threatening banks’ market position. There was once a time when a career in finance was highly sought after amongst the graduates from Oxford, Cambridge and other leading universities. This is no longer the case and finance is no longer a dream for millennials. Instead, they are attracted to careers in artificial intelligence and related technologies, and they want to work for organisations like Google. This means that FS firms are facing a talent shortage which in turn makes it much harder to foster a culture of innovation. The more radical thinkers are working elsewhere and banks are struggling internally to drive innovation. The means that they need to collaborate much more with external organisations, startups that wish to complement and work alongside FS firms rather than replace them. banking industry especially will be hugely different in five years to how it is now, but that’s not to say that there is no hope for such companies. Managing the increased regulation is taking an inordinate amount of time for banks. In our recent interview with EY’s EMEIA Financial Services Partner Pierre Pourquery he estimated that banks were spending around 40% of their time doing this, due to the complexity of requirements and of the banks’ own structure. With a global business model and a global pricing model, the constraints of local regulation can be vast and become prohibitively complex. 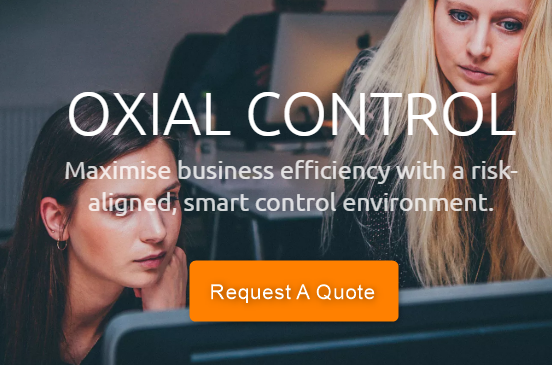 There is a constant requirement for new controls, processes, reporting, governance, committees, and on occasion, even new organisations. That’s why OXIAL’s supervised compliance approach can really help banks adjust to this new era. It can connect all the disparate elements of a bank – different geographies, departments, functions, teams and more – and relies on automation to ensure that all controls are in place and are updated when and where they are required. This is an enormous undertaking and one that is proving difficult for many banks. It’s also an important example of digital transformation within the FS industry. Modern regulation and compliance is so big and so complex, that it needs a digital and automated solution to manage it – the old approaches are simply not sufficient. Not only will OXIAL amplify weak signals so potential issues get noticed, it is also clear whether or not a control has been put in place. This means that banks can demonstrate to regulators that they are compliant, making life much easier. Digital transformation is an imposing task for banks, but collaboration with organisations such as OXIAL can help take the strain. For further information on how our supervised compliance approach can work for banks and other FS firms, please get in touch with us.